Virginia Owusu-Mainoo says that the cold can sometimes cause her knee to stiffen. 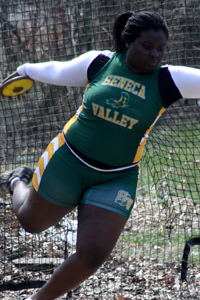 Despite the temperature hovering around 40 degrees, she was moving well when she spun and released for a new personal best mark of 36 feet and 8 inches. Her coach immediately teased her: Where was that at states? Owusu-Mainoo smiled and shrugged. A throw like that would have won the 3A shot put state title just a few weeks ago. Instead she had settled for second place with a throw of 36-00.50, less than two inches shy of the winning mark. At the time it was her first recorded mark over 36 feet. Owusu-Mainoo said that she has a friendly rivalry with Blake's Rachel Porzel, who won this year's indoor 3A state shot put title. Porzel has conceded that Owusu-Mainoo is better in the discus, but Owusu-Mainoo thinks she can get the best of Porzel in the shot put, too. Owusu-Mainoo is not only measuring herself up against Porzel, but also in her words trying to get out from the shadow of her own brother. Many know her brother Bernard Wolley as a football and wrestling star who has two individual wrestling state titles. While Wolley plays baseball this spring just to prove he can, Owusu-Mainoo has her sights set on a meet at Morgan State where she wouldn't mind winning a pair of state titles of her own. At the end of the day after all track events were completed, Owusu-Mainoo and the other throwers were still tossing the discus into a slight breeze. On multiple occasions she said she released too high and had the disc knocked down by the wind. On the first throw of the finals, she said she picked up more speed on her rotation and released at a lower angle. The result was a mark almost ten feet further than any other mark on the day. 110 feet was five feet shy of last year's personal best. There is more to come according to Owusu-Mainoo, who was pleased with her season-opening performance. The Clarksburg boys and girls won the team titles at the third annual Seneca Valley Screamin' Eagle Invitational.